So, upon having discussed and examined the possible background to ones interest in tessellation in Essay 1, The Background to Tessellation, a relevant question to ask is what sort of abilities are thus in order to produce representational tessellations? Now, it may very well be thought that people from any of the previous discussed scientific disciplines would be at a great advantage, as when compared with the artistically inclined, they would be inherently aware of the rules underlying tessellation. Indeed, this is indisputably so. However, despite many eminent people in those fields, including professors of mathematics, none can be seen or said to have produced anything that can be regarded as 'worthwhile' in comparison to Escher. Indeed, it must be admitted, their attempts (if at all) do not even remotely approach Escher’s in terms of inherent quality. In contrast, perhaps somewhat surprisingly so given the mathematical nature of tessellation, all the quality examples since the time of Escher have been composed by the artistically inclined, and not therefore from the much more obvious mathematical or scientific fields. Now, why should this be so? What, in essence, makes somebody a representational tessellator? Essentially, having briefly mentioned this in Essay 1, The Background to Tessellation, this involves what I term as imagination, and more precisely the potential for shape recognition, discussed in detail below. Hamlet: Do you see yonder cloud that’s almost in shape of camel? Furthermore, of interest is that Escher himself also played likewise games, adding various motifs to paint on the wall in his bathroom to amuse his children (as recalled by his son George in M.C. Escher: Art and Science, page 7). Indeed, despite being such a simple pastime, with the thought in mind that such matters are too frivolous or childish for the scientifically inclined, such pastimes even occupied Leonardo da Vinci, who also amused himself in this way (a quotation on this matter by da Vinci, translated by Escher, is in the book Escher The Complete Graphic Work, page 160). • Indirectly, by noting that a given tessellation has ‘potential’ in that a rudimentary creature is discernable that can 'evolve' in due course (for example, Escher's Horseman which began most simply). At this particular stage, the motif need not necessarily be of the highest quality (indeed, it is frequently of a most rudimentary nature), as the lines can subsequently be refined. What is of the most importance is the proto motif, that is, noting that it has ‘potential'. However, such an ability or talent seems to be lacking in most people, or perhaps is lying dormant, awaiting a prompt. As to my own abilities in this matter, I do indeed distinctly recall that at a young age, approximately 10-15 years of age (unfortunately, I cannot be precise), I was indeed aware of such a ability. However, this was of an isolated example, of which that until becoming interested in tessellation I had no use for. 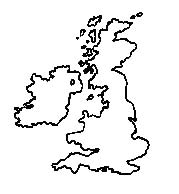 Specifically upon observing a map of the British Isles (below), I thus recognised such a shape. Can you use your imagination here and see a bird, fish, human …? As such, once pointed out it appears so obvious, and is noticeable at each view of the map (answer given below). Indeed, as the map occurs every day with the British weather reports, millions of people have had the opportunity to see this, but have not apparently recognised the shape I have noticed. How Soon Will Representational Tessellation Ability Arise? Assuming some degree of talent of ‘shape recognition', of interest is just how soon should one expect life-like tessellations of an at least ‘reasonable' standard to be produced. Such matters of drawing representational tessellations are not easy, due to the lack of books in which this aspect is discussed. Although occasionally ‘How to‘ books and articles are indeed to be seen, these are of somewhat less worth than may be thought, as the authors lack skill in representational tessellations. Indeed, as previously discussed, there are only a handful of people capable of producing worthwhile examples, and of these, no publications are forthcoming. Essentially, one is left to ones own devices, of which although such matters can be overcome, as illustrated by Escher, myself, and a few others, some guidance is indeed preferable. Oddly, most people involved in tessellation seem reluctant to detail their processes, of which in contrast I give my own quite freely. Upon examining Escher's tessellations and background to this matter (discussed more fully by myself in An Essay on M.C. Escher's 1-137 Numbered Drawings - An Introduction), some initial efforts undertaken on an essentially ad hoc basis in 1922 and 1926 or 1927 can be seen to be lacking in inherent quality. Consequently, such matters thus effectively discouraged a more intense study, thus leading to a return to his more orthodox work. However, upon a second visit to the Alhambra in 1936, his interest was reawakened, from which he then made a more considered effort of creating representational tessellations. Upon returning home and making a journey to his parents in the Hague, these were then discussed, and upon showing these to his brother, Beer, who was also visiting, he thus recognised their connection to crystallography. This was then followed by an active search of crystallographic journals by Beer in seeking out existing tessellations, of which most notably an article by George Pólya in Zeitschrift für Kristallographie ‘Über die Analogie der Kristallsymmetrie in der Ebene' was influential, with a direct study of the diagrams by Escher himself being undertaken. From these readings, his first ‘proper' tessellations then emerged. Further examples quickly followed, resulting in a whole host of tessellations in the style of which he has become renowned. Indeed, these ‘early years' resulted in a veritable outpouring of periodic drawings, of which with subsequent years, for a variety of reasons, he was never able to match in such quantities. Essentially, it can be said that he developed the ‘knack' of life-like tessellation very quickly, having been shown the ‘open gate of mathematics' as he put it. From initially relatively poor examples, high-quality examples then emerged in short succession, such as with periodic drawings 18 and 20 (which later were used for his renowned prints Day and Night and Sky and Water I). Therefore, Escher's true ‘study period' can be seen to be most short, a matter of mere months. Such a ‘pause' and subsequent study echoes my own studies, whereby in 1986 I merely ‘dabbled,' lacking any real mathematical understanding worthy of the name, before in July 1987 I made a more concerted effort. However, it was not until February 1988 that anything of true, original tessellations emerged, albeit still mostly rudimentary, although ‘promising' in their nature. Indeed, one of my own favourite motifs, Human Figure 1, No.1 dates from this period. Likewise, as with Escher, this marked a watershed in my own development, with a ‘outpouring' of tessellations quickly following, albeit not in a generally finished state as with his numbered drawings. Therefore, from all this, it can be seen that essentially one either intuitively understands tessellations or not at a relatively early stage in ones ‘tessellation career.' Essentially, if the early efforts are ‘encouraging' this thus naturally results in further study, whereas if no improvements are initially forthcoming (as Escher found in 1922), ones enthusiasm is naturally lessened, with the likelihood of pursuing such matters, at best, being put aside, or more probably abandoned in favour of other pursuits. However, pleasingly, age is not an apparent factor per se as is often the case in creating original mathematics, as Escher himself began his own studies at the relatively late age of 38. Furthermore, upon establishing tessellation of a reasonable standard, it can be seen that progression as to inherent quality does not, as may have been thought, continue with the passing of the years, but essentially remains static. Certainly, ‘refinements' do indeed take place, but there is no arrow-like continuum of improvement. For instance, using Escher's examples, a periodic drawing from the 1930s could quite easily be mistaken for one of the 1960s. As such, this is not due to a lack of ability, but is rather a consequence of the specialised nature of representational tessellations in which the underlying symmetry ‘forces' outlines that at times leaves a lot to be desired as regards the representation aspect. Therefore, this simply has to be accepted as a matter of course, albeit this should not be used as an excuse for slipshod work that is quite plainly of an unacceptable standard. 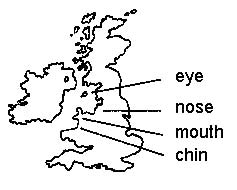 Solution to the British Isles 'shape recognition' question: a head, in profile.